I made it to Orlando and back and managed to get a little bit of sewing in. It’s the busiest time of the year for educators, so work is a little demanding right now. I wanted to share a couple of my projects, though, just to make sure I stay on track. Little by little, I am learning how to embroider better and feeling more confident about trying more complicated designs. 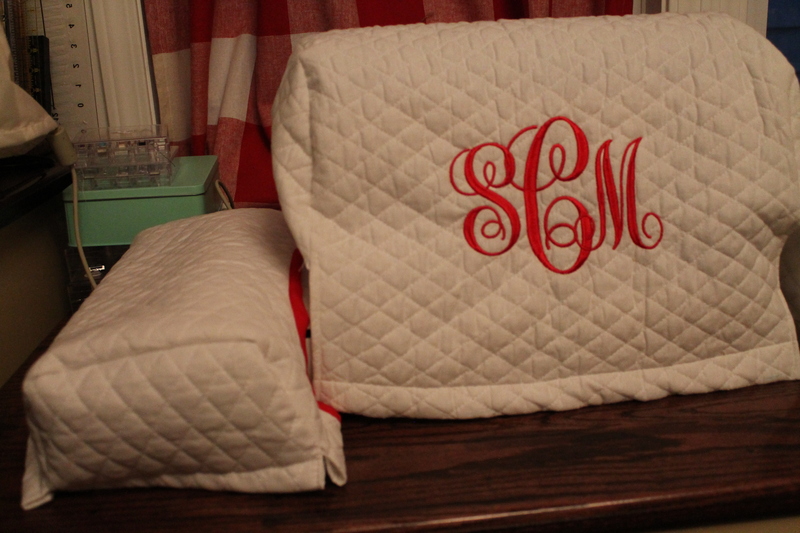 The first thing I tackled after returning was a machine cover for my new Brother. I bought a PE770, and the hoops are much bigger. I love Brother machines and have decided I won’t ever buy a different brand. They are so easy to use, and there was no learning curve between the 770 and my 400. I bought the pattern from a group administrator on Facebook, and it was easy to make because her directions were perfect. 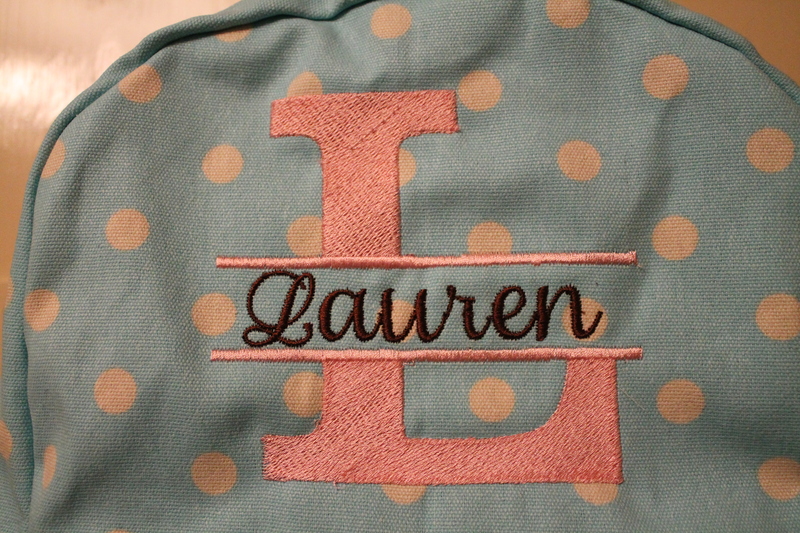 I would like to embroider a pattern on the back, but for now, I’m happy. 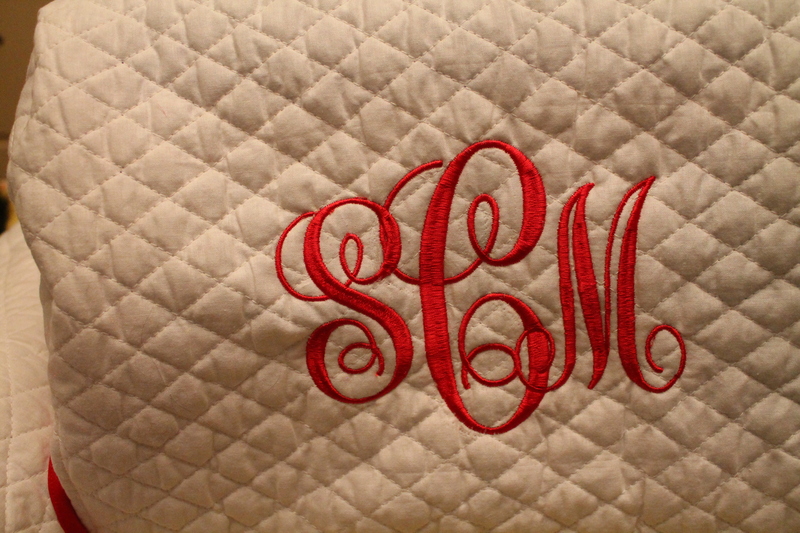 Here is a close-up of the monogram. For being so large, it stitched out nicely. My next project was a tote bag for my daughter, who teaches 8th grade science. She is a Hello Kitty maniac and always has been. 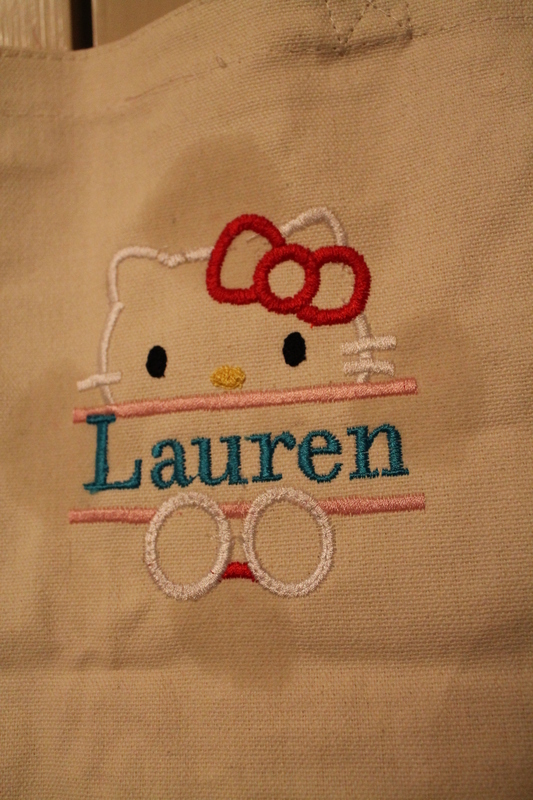 If Hello Kitty came to town, Lauren would run away with her/him/it (no one really knows what Hello Kitty is, do they?). Forgive the water spots in the first picture – I was erasing the washable marking pen, and then Lauren took the bag so I couldn’t get a better picture. Here is the back side. 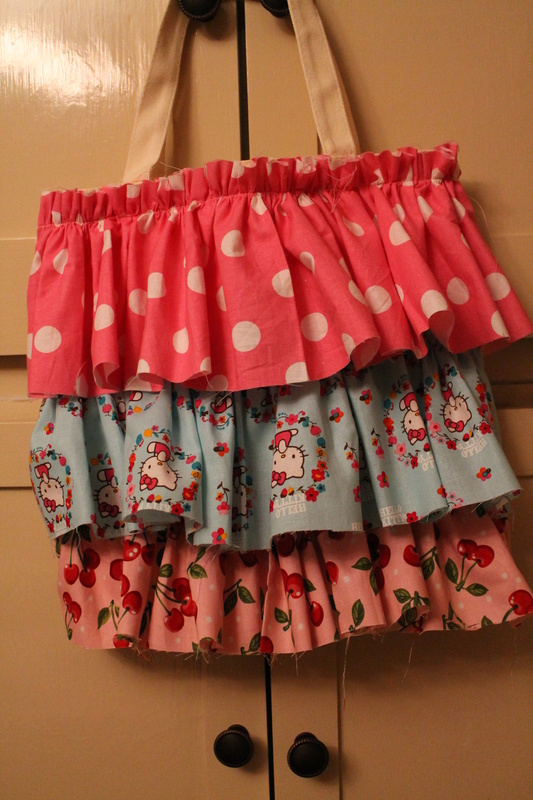 the ruffles are unhemmed on purpose to get a fair amount of fray, but it also made the project go faster. It was a throw-away bag that I decided to keep and give to her. It was one of my first attempts at using software to manipulate a design. 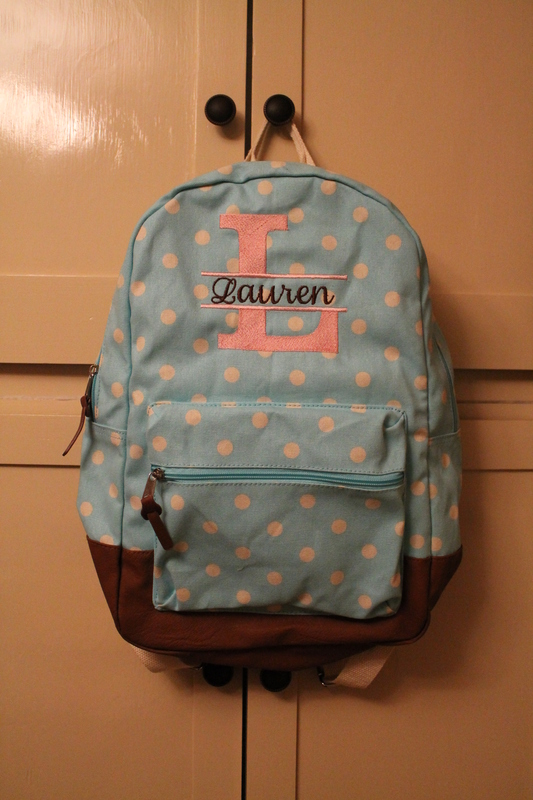 I made these two backpacks for Lauren and myself. 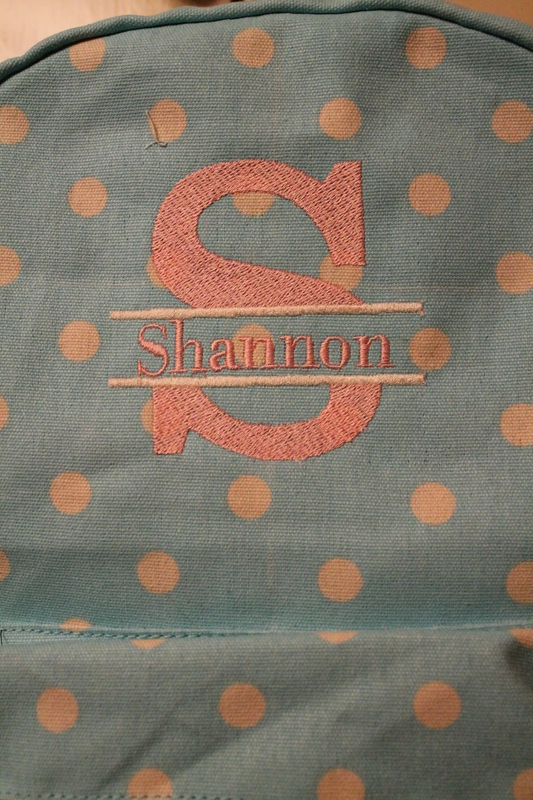 I made mine first, and when I stitched hers, I increased the font so that it is bigger and changed the font of the name. I wish I had done the same to mine as I like hers much better. Hooping backpacks is a challenge, but I floated them in the hoop and pinned them tightly. I also pinned the bottom so that it didn’t drag. 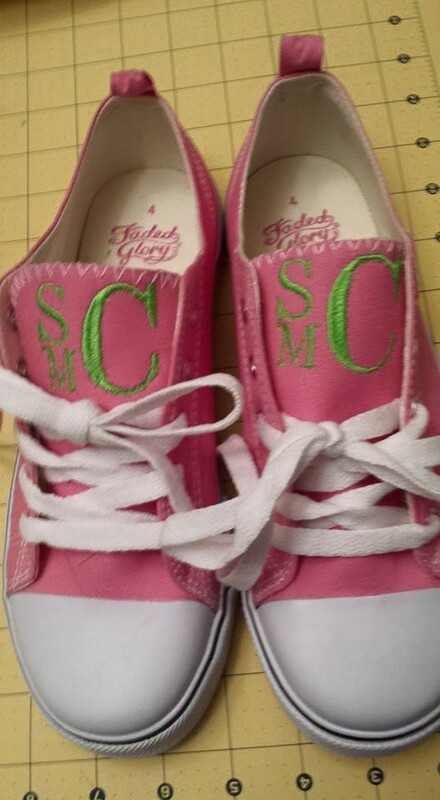 There were time consuming and scary, but I am happy with how they turned out. It was nice to get into my sewing room for a little bit. This weekend is my last long weekend before faculty return and then the semester starts. I’m getting my hair cut and colored (a major ordeal because it is so curly and unruly, lol), but I’m still hoping for a little time to create. I’m going to share some pictures of a little reno in my upstairs bathroom this week, too. I hope your week is great and you day is happy! 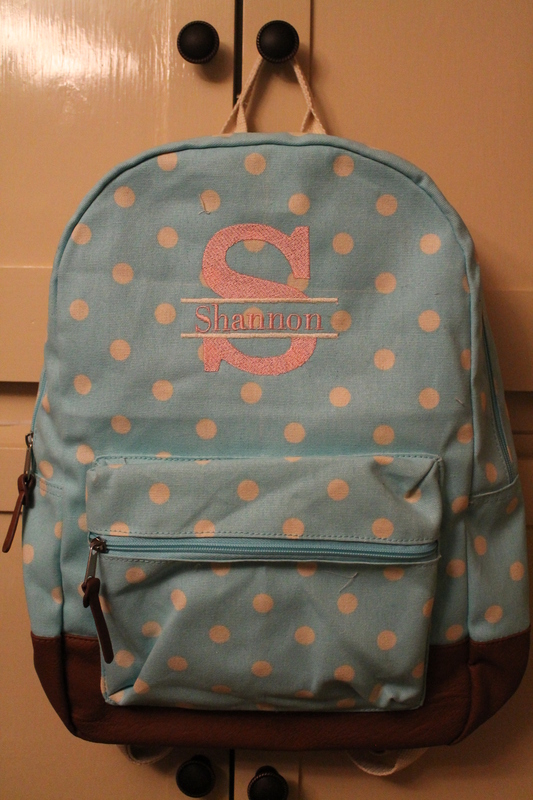 Shannon, not sure what “hooping” is, but the backpacks are quite nice! They would make the perfect back-to-school gift. Actually, I rather like everything you’ve sewn. 😉 I understand the need to cram it all in, as I am an ITRT at a small school and start back on Monday. I like my work, but hate the thought of giving up the rest of my summer. Good luck with the new school year!